POEMS (peripheral neuropathy, organomegaly, endocrinopathy, M protein, skin changes) syndrome is a rare multisystem paraneoplastic disorder that occurs in the setting of a plasma cell dyscrasia. A 57-year-old male with initial presentation of peripheral neuropathy of lower limbs and a peripheral blood picture of megaloblastic anemia, presented with progressive lower motor neuron weakness over few months; followed by additional features of skin hyperpigmentation, generalized lymphadenopathy, erectile dysfunction, weight loss, and an attack of cerebrovascular accident (stroke infarct) which recovered. On further evaluation with time, there were presence of hepatosplenomegaly, Castleman's disease of the lymph node on biopsy, serum electrophoresis suggestive of monoclonal gammopathy with light band lambda chain, and endocrinopathy (hypothyroidism and hypogonadism). His bone marrow was suggestive of plasmacytosis. This case report describes a patient who presented with initial picture of peripheral neuropathy with megaloblastic anemia, but when followed-up there were diverse clinical manifestations fulfilling the diagnostic clinical criteria of POEMS Syndrome. 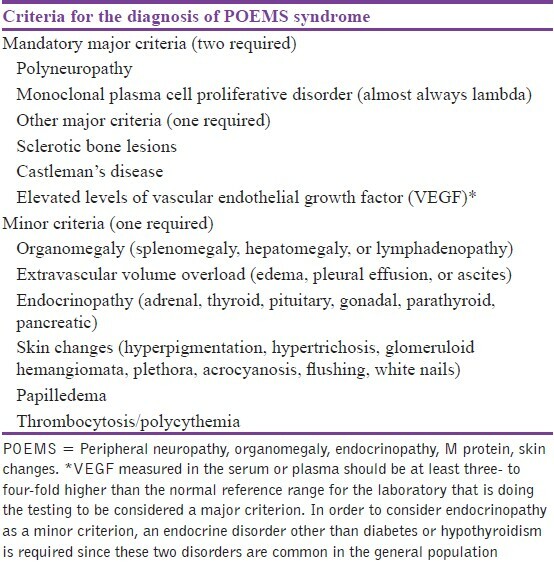 POEMS (polyneuropathy, organomegaly, endocrinopathy, M protein, skin changes) syndrome is a distinct pathological entity with diverse clinical manifestations. It is a rare multisystem syndrome associated with plasma cell dyscrasia that consists of the following features: polyneuropathy, organomegaly, endocrinopathy, monoclonal gammopathy, and skin changes. POEMS syndrome is also known as osteosclerotic myeloma or Crow-Fukase syndrome and Takatsuki's syndrome. The disease is characterized by the presence of a monoclonal plasma cell disorder, peripheral neuropathy, and one or more of the following features: Osteosclerotic myeloma, Castleman's disease, increased levels of serum VEGF, organomegaly, endocrinopathy, edema, typical skin changes, and papilledema. POEMS was first reported in 1938 by Scheinker's et al., in a 39-year-old male with solitary plasmacytoma, sensorimotor polyneuropathy, and localized patches of thickened deeply pigmented skin on the chest. In 1980, the acronym "POEMS" was suggested for this disorder. Not represented in the acronym are several important features; including sclerotic bone lesions, Castleman's disease, papilledema, pleural effusion, edema, ascites, and thrombocytosis. The exact cause of the disease is still unknown, but the proposed factors being chronic overproduction of proinflammatory and other cytokines (e.g., vascular endothelial growth factor (VEGF)); with microangiopathy, edema, effusions, increased vascular permeability, neovascularization, polyneuropathy, pulmonary hypertension, leukocytosis, and thrombocytosis as possible examples of their effect. The prevalence and incidence of the disease is not known and is still considered a rare entity. The disease being rare, its incidence has been said to be underreported and most cases of POEMS are said to be unrecognized. We report this rare entity, which at first was misled by other clinical features, but with recurrent follow-up the diagnosis of the POEMS syndrome was made. A middle-aged, 57-year-old male presented to us with history of tingling sensations in bilateral lower limbs with hyperesthesia for the last 15 months. His symptoms gradually progressed over a period of 2-3 months to motor weakness with difficulty while walking. He was evaluated for the same 6 months back and his blood picture was suggestive of megaloblastic anemia with hemoglobin of 10 g%, hypersegmented polymorphs, and raised mean corpuscular volume (MCV) level (100 fl). Taking it to be a peripheral neuropathy secondary to megaloblastic anemia, he was treated accordingly with vitamin B12 supplementation and folic acid along with membrane stabilizing drugs (amitryptilline, gabapentine). However, there was no improvement and his symptoms progressed which on clinical evaluation was suggestive of bilateral symmetrical motor (distal more than proximal) weakness with sensory polyneuropathy. Neurological examination of cranial nerves and upper limbs were normal. He underwent a nerve conduction study which revealed severe sensory-motor mixed (demyelinating > axonal) polyneuropathy. He developed hyperpigmentation of the skin since then, which was progressive since last 6 months. Significant weight loss was also present. A history of cerebrovascular episode occurred after 4 months of the main symptoms in form of weakness of right side of the body which gradually recovered, with imaging study suggestive of acute infarct in the left temporoccipital region. The patient had history of erectile dysfunction with the onset of peripheral neuropathy. There was no history of exposure to arsenic or lead. On clinical examination his vitals were stable, with significant lymphadenopathy of right posterior cervical area, bilateral axillary area approximately 1 × 2.5 cm along with multiple lymph nodes in inguinal region and along saphanous veins which were not fixed to the underlying tissues and were firm in consistency. There was also hepatosplenomegaly. On laboratory analysis, serum testosterone level were low (155 ng/dl, normal: 300-800 ng/dl) with high thyroid stimulating hormone (TSH) level (9.15 mU/l, normal: 1-5 mU/l). 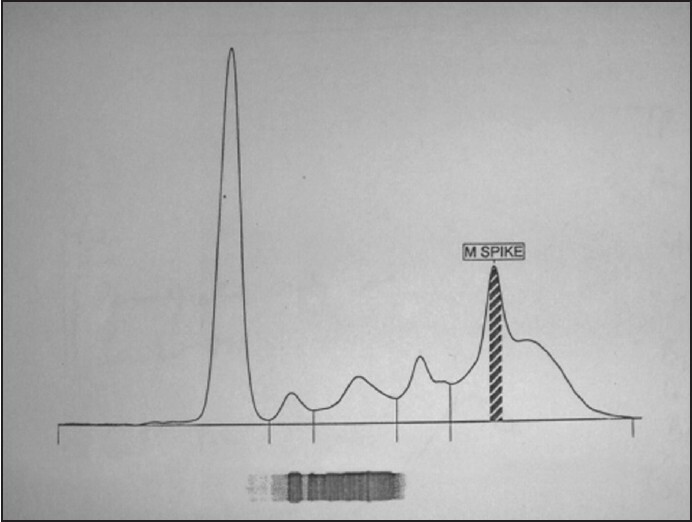 The serum protein electrophoresis done was suggestive of prominent M-spike (7.7%, 0.60 g/dl) [Figure 1] with a positive lambda light chain. His repeated hemoglobin was 13 g/dl, with total whole blood count of 6,800/mm 3 and platelets of 502,000/mm 3 , normocytic normochromic peripheral blood picture. Bone marrow showed presence of mild plasmacytosis (6.5%). The serum ionic calcium (0.9 mmol/l, normal: 1.12-1.32 mmol/l) and total serum calcium (8.3 meq/l, normal: 8.7-10.5 meq/l) was low. X-ray of the pelvic bones and spine did not reveal any osteosclerotic lesion. The blood sugar levels and glycosylated hemoglobin levels were normal. Lymph node biopsy was suggestive of Castleman's disease showing giant lymph node hyperplasia. The diagnosis of POEMS was made after a careful history, examination, and proper laboratory analysis in the patient. The presence of polyneuropathy with monoclonal protein (M band) and lambda light chain and lymph node biopsy suggestive of Castleman's disease satisfied the major criteria for POEMS as per the diagnostic criteria. Other minor criteria present were organomegaly (hepatosplenomegaly, lymphadenopathy), endocrinopathies (hypogonadism, hypothyroidism), and skin changes (hyperpigmentation). This is probably the first ever case reported in literature which describes our patient who presented initially with peripheral neuropathy with hyperpigmentation, thought to be secondary to megaloblastic anemia. The diagnosis of POEMS was made as per the diagnostic criteria [Table 1]. Multiple myeloma seemed unlikely since no oliglonal band were seen on serum electrophoresis; hemoglobin, serum creatinine, and calcium were normal; and X-ray of bone showed no osteolytic lesions. Moreover, presence of polyneuropathy in the patient made multiple myeloma less likely. Though monoclonal gammopathy of undetermined significance (MGUS) and Waldenstorm's macroglobulinemia shows M protein on electrophoresis, they are not associated with end organ damage or organomegaly. The diagnosis of POEMS has been based on fulfilling the diagnostic criteria which consist of five major (two of them mandatory) and six minor criteria [Table 1]. Our patient fulfilled three major criteria along with three minor criteria. There is no definitive diagnostic test for POEMS, but measuring of VEGF supports the diagnosis. A plasma VEGF level >200 pg/ml has a sensitivity and specificity of 68 and 95%, respectively, in support of a diagnosis of POEMS syndrome. However the measurement of VEGF could not be done in our patient. The diagnosis of POEMS syndrome also depends on the demonstration of a monoclonal immunoglobulin in the serum or urine, or increased numbers of monoclonal plasma cells in a biopsy specimen from the osteosclerotic lesion or the bone marrow which was present in our patient. Besides routine blood investigation, useful blood tests to identify endocrine anomalies include luteinizing hormone, follicle stimulating hormone, prolactin, parathyroid hormone, thyroid function tests, testosterone, estradiol, cortisol, and fasting blood glucose. Our patient had erectile dysfunction with low testosterone levels, though his prolactin levels were not measured. Serum electrophoresis is needed to detect the classical λ-restricted M protein. Computed tomography (CT) and magnetic resonance imaging (MRI) helps to differentiate the nature of bony lesions. Bony lesions associated with POEMS syndrome can appear sclerotic, lytic with a sclerotic edge, or have a mixed 'soap bubble' appearance. A full skeletal survey is required in order to ascertain whether the lesion is solitary. The lesion should be biopsied to determine the nature of the lesion as over 95% of patients with POEMS have a monoclonal l plasmacytoma. We would like to highlight this unusal presentation of POEMS syndrome as megaloblastic anemia and peripheral neuropathy. A careful history and examination can help physicians clinche the diagnosis in such cases. 1. Driedger H, Pruzanski W. Plasma cell neoplasia with peripheral polyneuropathy. A study of five cases and a review of the literature. Medicine (Baltimore) 1980;59:301-10. 2. Dispenzieri A. POEMS syndrome: Update on diagnosis, risk-stratification, and management. Am J Hematol 2012;87:804-14. 3. D'Souza A, Hayman SR, Buadi F, Mauermann M, Lacy MQ, Gertz MA, et al. The utility of plasma vascular endothelial growth factor levels in the diagnosis and follow-up of patients with POEMS syndrome. Blood 2011;118:4663-5. 4. Miralles GD, O'Fallon JR, Talley NJ. Plasma-cell dyscrasia with polyneuropathy. The spectrum of POEMS syndrome. N Engl J Med 1992;327:1919-23. 5. Dispenzieri A. How I treat POEMS syndrome. Blood 2012;119:5650-8. 6. Kuwabara S, Dispenzieri A, Arimura K, Misawa S, Nakaseko C. Treatment for POEMS (polyneuropathy, organomegaly, endocrinopathy, M-protein, and skin changes) syndrome. Cochrane Database Syst Rev 2012;6:CD006828. 7. D'Souza A, Lacy M, Gertz M, Kumar S, Buadi F, Hayman S, et al. Long-term outcomes after autologous stem cell transplantation for patients with POEMS syndrome (osteosclerotic myeloma): A single-center experience. Blood 2012;120:56-62.